Crooked River lies within the Fraser Basin, an irregularly shaped basin of gently rolling hills and shallow lakes covering much of North Central B.C. Three beautiful lakes are contained within this 963 hectare park. The centre of activity of this park, an hour drive north of Prince George, is beach-fringed Bear Lake. The fine, sandy beaches are some of the best in the region and are favourites of swimmers and sunbathers. Fishing, hiking, camping and nature study are also popular activities with outdoor enthusiasts. Visitors like to hike to nearby Square Lake or along the willow-lined Crooked River, the original route of early explorers. A natural feature in the park is Livingston Springs a cold water springs that run year-round). Help protect the park land. Enjoy Crooked River Park but please leave it as you have found it so that future visitors may also enjoy the park. For safety reasons, firearms are not permitted in the park. Crooked River Park is closed to hunting. No alcohol is allowed on the beach or in the day-use area. Pets are not permitted in the day-use area and must be kept on a leash at all times in any other area of the park. Safe swimming practices are a must! Visitors are encouraged to remain within the designated area. As no lifeguard is on duty, children should be watched at all times and solo swimming should be avoided. To avoid problems with nuisance animals such as bears, please lock food in your vehicle at night and be sure to use the garbage containers provided. Never feed or approach bears. As the park is situated in open pine forest, it is tempting to walk off the trails. Visitors should keep in mind that it is easy to loose bearings in pine forests as the terrain is unvarying and can be confusing. The park is located 70 km north of Prince George on Highway #97. This is approximately a one hour drive. The closest communities, towns and cities are Bear Lake and Prince George. History: Crooked River Provincial Park was originally established to protect its attractive lakes and surrounding landscape. The lakes are a result of the melting of the glacial ice blocks. Cultural Heritage: The Crooked River was once the corridor of the famous explorers Alexander MacKenzie and Simon Fraser. Conservation: The gently undulating landscape is covered by a thick layer of glacial drift supporting a forest dominated by white spruce, lodgepole pine and Douglas-fir, known as the Sub-boreal Spruce Zone. The forest cover within the park boundaries consists mainly of lodgepole pine interspersed with alder, birch, aspen and spruce. It sits atop a sand and gravel soil, the result of thousands of years of glacial activity in the area. Flowers, trees and shrubs are part of the park’s natural heritage. Wildlife: One of Crooked River Provincial Park’s trails takes visitors to and around Square Lake, an excellent spot for nature viewing. 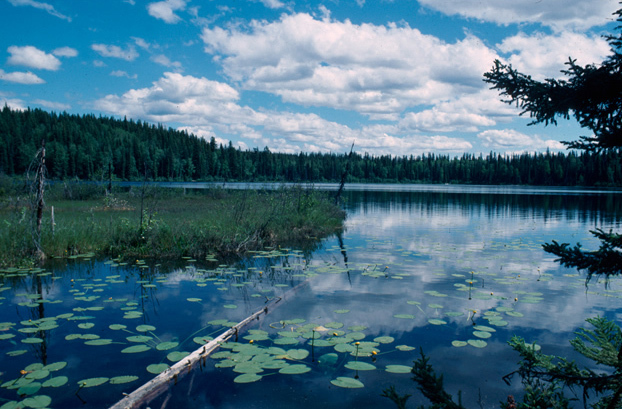 The lodgepole pine forests, lakes and wetlands of the park provide excellent habitat for a number of mammals and birds. River otter, beaver, muskrat, squirrels, and chipmunks are the most common residents. Lynx, red fox, coyote and black bear may also be seen. Many birds frequent the park including bald eagles, ospreys, tanagers and chickadees. In the winter, Crooked River is visited by trumpeter swans. Park users should always be aware of bears and other wildlife in our park environment. Never feed or approach bears or other wildlife. Canoes and kayaks are welcome. Bicycles are allowed on all park roads, however, they are only allowed on trails that are signed for bicycle use (very few trails are signed for bikes). Anyone fishing or angling in British Columbia must have an appropriate licence. Crooked River, Square Lake and Hart Lake provide good angling for rainbow trout, Dolly Varden or Rocky Mountain whitefish. Gate to Hart Lake parking lot is open at this time. Only Square Lake is available for ice fishing and is a popular lake among the locals. Hart Lake is closed to ice fishing. Check the below regulations for specifications. Please note: There have been regulation changes regarding the amount of fish allowed to be kept. Please view the Freshwater Sport Fishing Regulations Synopsis for specific information. Click here for hiking/trail information. For your own safety and preservation of the park, obey posted signs and keep to designated trails. Shortcutting trails destroys plant life and soil structure. Pets/domestic animals must be on a leash at all times and are not allowed in beach areas or park buildings. No pets are allowed in the day-use area. You are responsible for their behaviour and must dispose of their excrement. Backcountry areas are not suitable for dogs or other pets due to wildlife issues and the potential for problems with bears. For swimmers and sunbathers, the 460 metres of natural sandy beach of Bear Lake is the main attraction. Nearby change houses, picnic tables and firepits make it easy to spend a full day enjoying this natural playground. The pristine setting is safe and quiet since power boats are not permitted in the park. There are NO LIFEGUARDS on duty at provincial parks. There is no viewing platform but the abundant trail system allows access to lakes and Crooked River, which has lots of wildlife and scenic viewing possibilities. In winter, the Crooked River is a wintering ground for Trumpeter Swans. Great place to windsurf as there are only non-motorized vessels allowed in the park. All hiking trails and the campground loops are available for snowshoeing. Only Square Lake is available for ice fishing and is a popular lake among the locals. Hart Lake is closed to ice fishing. Cold well-water is available for cooking and drinking; taps are located throughout the campground and day-use area. There is a day-use/picnic area along the north shore of the lake. The area was rebuilt and modernized in 2007. It has flush toilets, running water, a sandy beach, a paved and gravel parking lot for 530 vehicles, picnic tables, garbage cans, picnic shelter, horseshoe pits (bring own horseshoes) and an adventure playground. PETS ARE NOT ALLOWED IN THE DAY-USE AREAS. Alcohol is not permitted in the day-use area. There is an adventure playground located at the south beach area of the campground. During the collecting season a sani-station/dump is available and a fee is charged for the service. This park has hot showers. This park offers 65 private and secluded vehicle accessible campsites. This campground will accommodate larger RVs. Campsite reservations are accepted and first-come, first-served sites are also available. A minimum of 4 consecutive weeks must be booked. The long stay program is available from May 15 to September 11 in this park. Please contact the park operator to book one of these sites. Information on other parks participating in this pilot program, or a link to the Long Stay Policy document, is available on the Frontcountry Camping Policies and Fees webpage. Some facilities in the park including washrooms are wheelchair accessible.